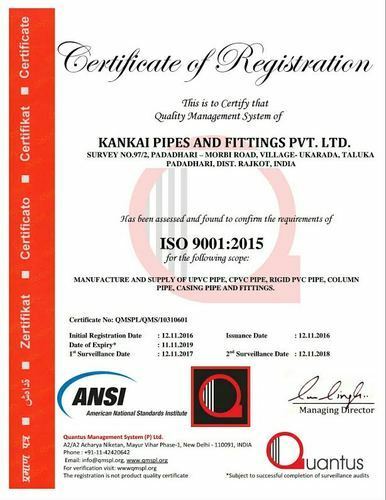 Established in the year 2013 we, "Kankai Pipes & Fittings Private Limited" are emerging as a reputed name in the pipes industry. We specialize in the manufacture and exporter of various kinds of Pipe & Fittings. Moreover, we have a stable and strong financial background, thereby ensuring our business expansion and progressive growth at an accelerated pace. We are exporting our quality products in Romania, Nigeria, United Arab Emirates and Kenya. We have always endeavoured to give the best quality of products. Highly qualified and well-experienced quality managers work with us, maintaining the level of quality required by the market. In addition to these, by offering customization facility, competitive pricing policy and supplying products on time, we are maintaining a long term relationship with our diversified clients. Under the guidance of our mentor, Mr. Dhaval Patel, we have been able to reach the new heights of success. His rich past academic record and profound expertise of this domain have helped us capture the market efficiently. As optimum levels of client contentment are required to grow and diversify in this highly competitive industry, client satisfaction has remained our primary organizational goal since the days of our establishment. Our modes of payment are completely trouble free and in addition to this, the latest fabrication technologies and manufacturing equipment manned by highly qualified and skilled personnel from the industry. we have positioned ourselves as the leading company engaged in this domain. This is well-equipped with the latest technology and other advanced amenities, which is managed by experienced professionals from every discipline. Our infrastructure is divided into various units like manufacturing unit, quality control unit, warehousing and packaging unit. We have a strong team of experienced professionals, which holds conscientious knowledge of the industry and the current market scenarios. These personnel are also well-versed with the advanced equipment, machines and tools that are installed at our different departmental units.